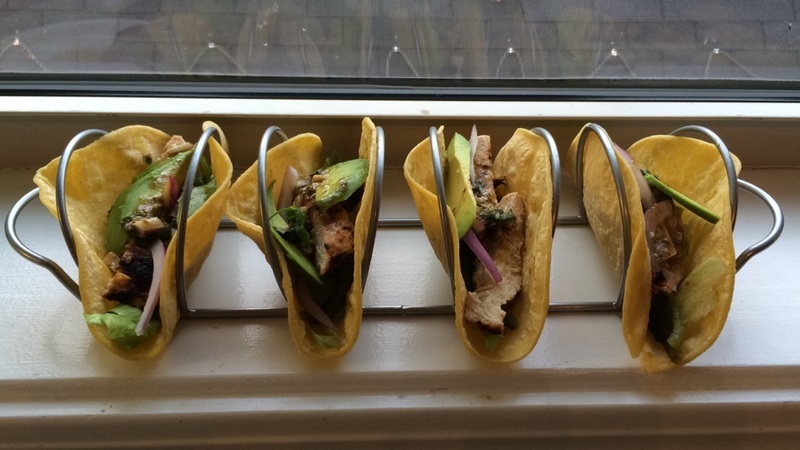 These tacos are a Rachel Ray magazine find. They are a nice and easy healthy weeknight dinner. I like the leftover chicken and peppers on a salad for lunch the next day. 1. Turn the broiler on high. Place the poblano pepper on a foil covered cookie sheet. Char the poblanos, until the skins are blackened, about 8 minutes. Remove from cookie sheet and let cool. Remove seeds and cut into slices. 2. In a bowl, whisk together cilantro, lime juice, olive oil, sesame seeds, coriander, cumin, agave, garlic, onion, and oregano. Add salt and pepper. 3. Brush chicken with 1/2 of sauce. Grill chicken, about 14 minutes. Drizzle with additional dressing. 4. Grill the tortillas, about a minute a side. Fill the tortillas with chicken, peppers, lettuce, avocado and onions. Drizzle with sauce.